Home Food & Nutrition Can Dogs Get Drunk? Dogs will ingest just about anything we give them, and that includes alcohol. Is that really a good idea even if it is just a drink of your beer? Can dogs get drunk? It's time to have a break! I can't wait for my pint. The brief answer is: Yes, Dogs do get drunk. According to veterinary nutritionist Dr. Jim Sokolowski, wine or beer in moderation won't hurt a pooch. 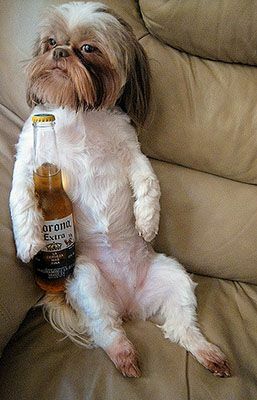 Just be aware that dogs can get drunk, and remember it takes less alcohol because their body weight is much less than a person's. Is Alcohol Dangerous to Dogs or Not? Some people may think it is funny or cute to give their dog a bowl of beer or wine. Of course, why not let the dog join the party? A drunk dog can, after all, be the life of the party. Not all pet owners know that alcohol is toxic to dogs. This is, in fact, a very dangerous situation for your dog. Alcohol is poison to a dog, and ingesting too much can, in fact, kill your dog by ﻿﻿ethanol poisoning. What Happens If My Dog Got Drunk? Behavioral changes will occur if your dog is drunk. Just like a human they will have problems walking or standing up due to lack of coordination. They can also experience drowsiness, excessive urination, involuntary defecation, vomiting, or be unresponsive. Other symptoms include decreased body temperature slow reflexes, and flatulence. Signs of more advanced alcohol poisoning include slowed breathing and heart rate, an increase in total body acid and heart attack. If left untreated, these things can result in the dog's death. If a dog has eaten before being exposed to alcohol, the signs, and symptoms of alcohol toxicity may be delayed up to two hours. Much like a human, the level of intoxication is dependent on how much alcohol was ingested, and how much the dog had to eat and when. Can Dogs Get Drunk Without Giving It Alcohol? 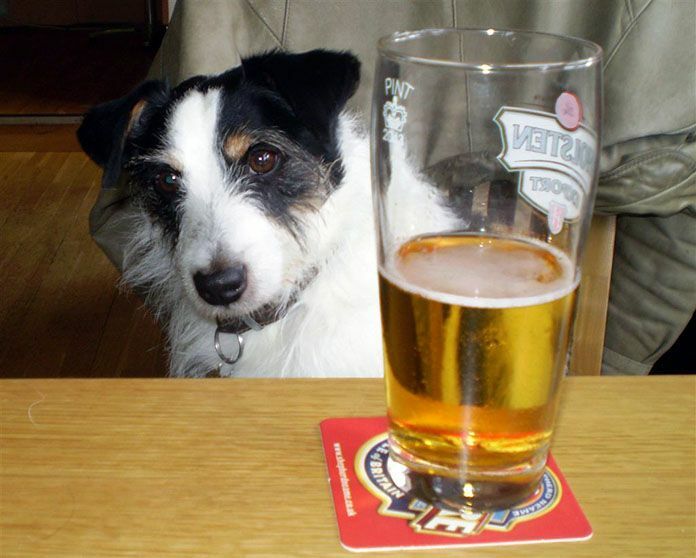 There are a number of ways a dog can get drunk without anyone actually feeding it an alcoholic beverage. Alcohol poisoning can be a result of ingesting a variety of different products. Any food stuff that can or will ferment such as bread dough or rotten apples can make a dog drunk. Dogs can find these things in the garbage along with other hazardous things. Other instances may be from spilled beverages, commercial products, or medications that have alcohol in them like cough syrup. Exposure to alcohol or ethanol-containing products through the skin is also possible, but would need to be in high concentrations. What Should I Do If My Dog is Drunk? Your vet will be able to much better diagnose treatment if they are aware of the cause of the poisoning. Dogs are not meant to consume alcohol. This can be extremely dangerous if not deadly to your dog. We must prevent our dog to be exposed to hazardous chemicals and alcohol. A drunk dog is definitely not funny or cute. We should also avoid coloring or dyeing our pet's fur. As tempting as it may be to turn your white dog pink, it may cause serious health issue to your little friend. Treating your dog with ‘smell good’ things is also not recommended. If your dog smells, give him a bath with a dog shampoo. Cologne or perfume is definitely out of the question. If you have any questions, or think your dog may be intoxicated, take him to an animal doctor immediately. Alcohol is poison, especially to a dog. I agree, dogs have smaller liver and too much booze can get them drunk. For any occasion, dog beer is a great & safe alternative. My dog likes to sniff my drink (beer or wine). I just make sure he wouldn’t drink it. My dog is pretty sensitive to alcohol, so I always keep watch on him. Nice info, but my dog likes alcohol. A sip of it won’t hurt though.